Paw Patrol is an absolute favourite here. 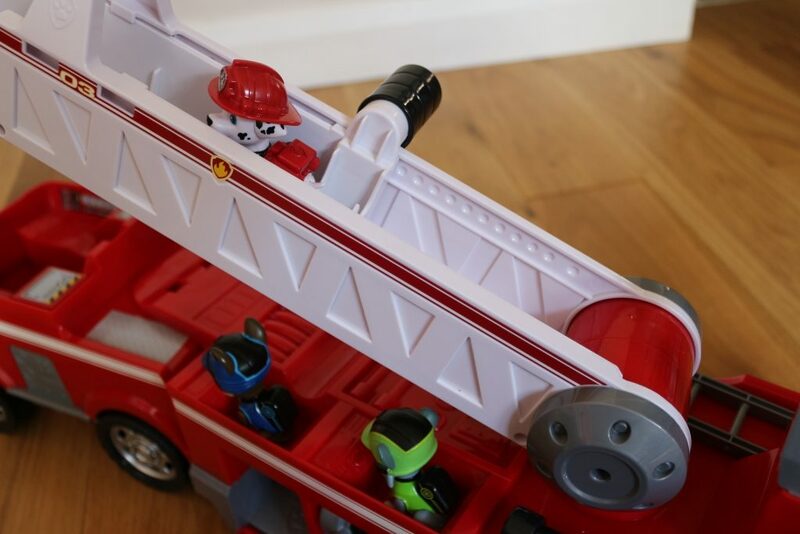 We previously reviewed the Mission Cruiser (review here) and it’s out all the time, so when I was offered the chance to review the new Paw Patrol Ultimate Rescue: Marshall’s Deluxe Fire Truck from Spin Master I thought ‘Christmas sorted!’. 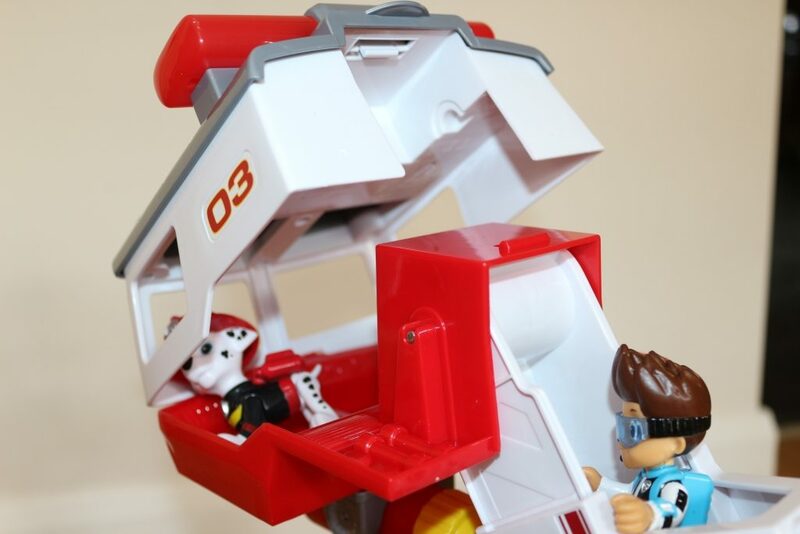 I had envisaged the Paw Patrol Ultimate Rescue: Marshall’s Deluxe Fire Truck to be around the same size as the Mission Cruiser; large but able to fit into an Ikea Kallax box. 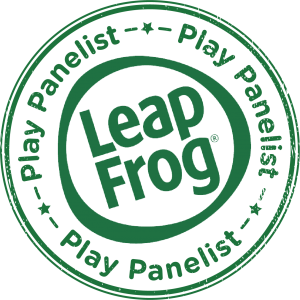 It arrived in a very big box and is a very big toy measuring 60cm or 2 feet long and the ladder extends even further! I have no idea where we’ll keep it but he’s going to LOVE it, I can guarantee you that much. 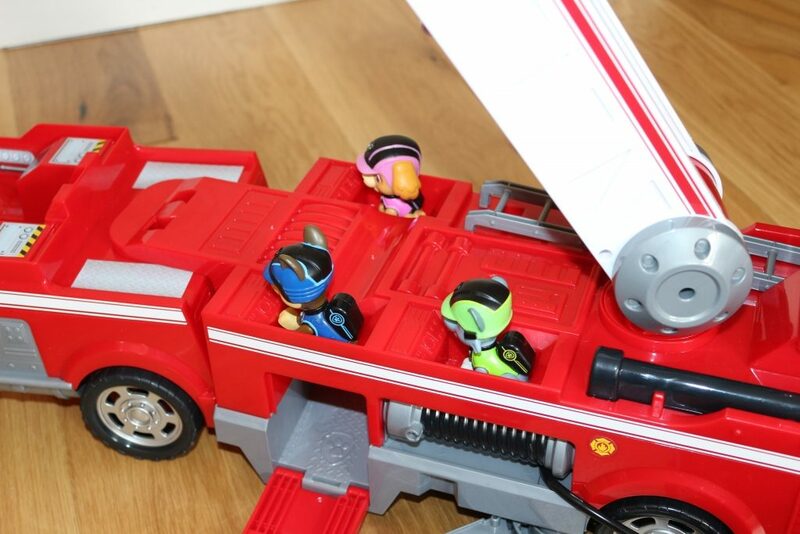 To remove Marshall’s Ultimate Rescue Fire Truck from the box you need a pair of scissors to cut the paper ties and then turn the box over and remove the bottom of the box to twist the plastic pegs keeping it in place. Once out of the box there are cardboard figures and elastic bands to remove, and some stickers which you apply according to the instructions. 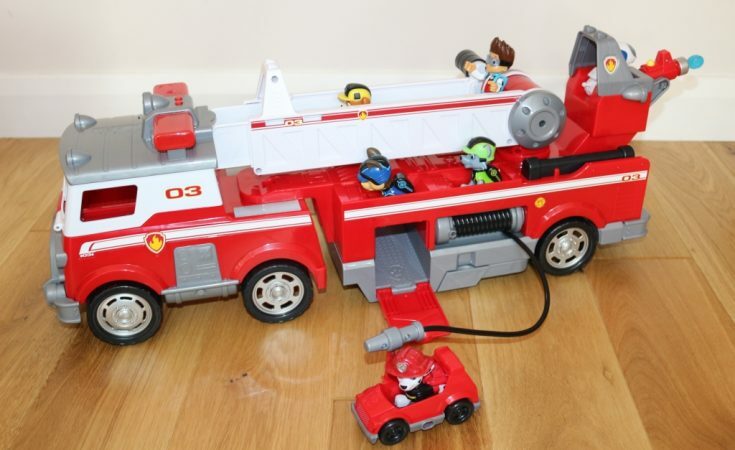 There aren’t many separate pieces except for the water cannon, which goes onto the back of the truck with a click. 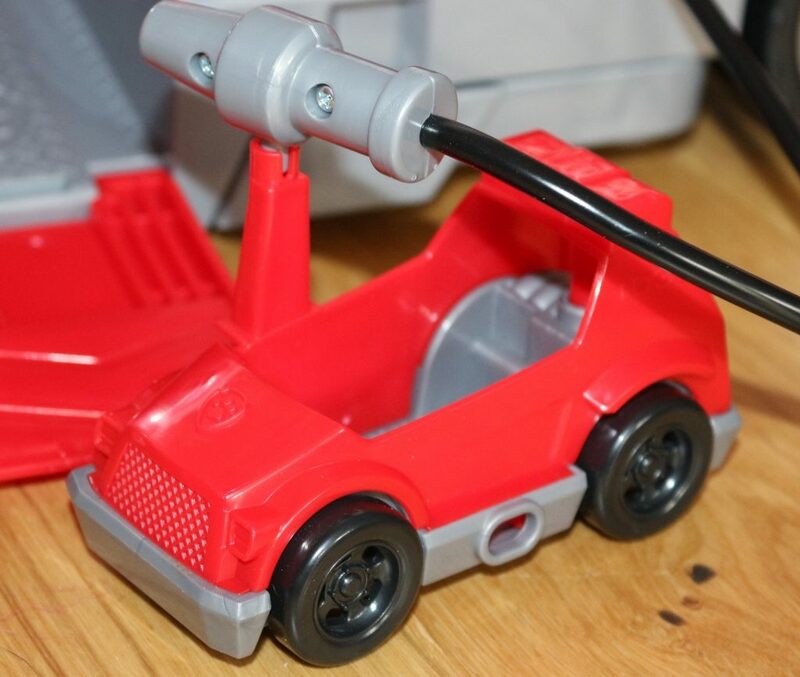 It already contains 2 x AA batteries (located in the cab with the on/off switch) so you are ready to play! Both parts of the vehicle, cab and white ladder are in one piece which cannot be taken apart. 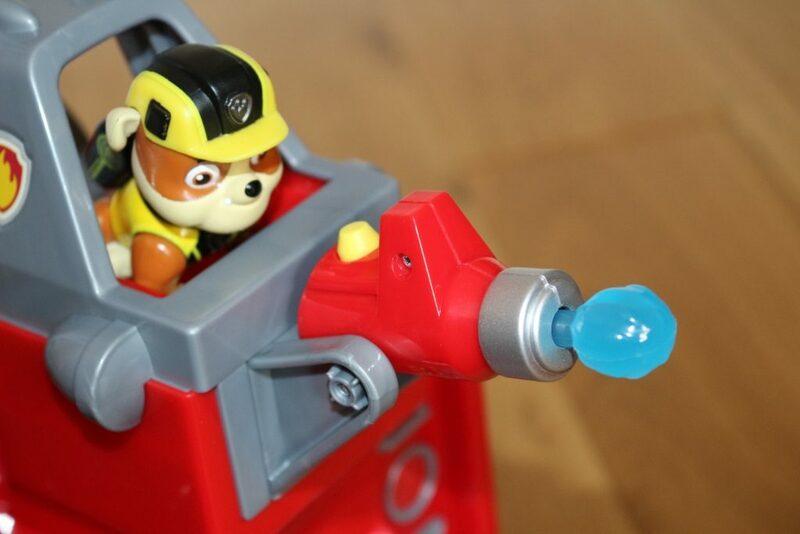 The vehicle has a hose and an a claw which extends and pivots which the Paw Patrol can use to grab things! 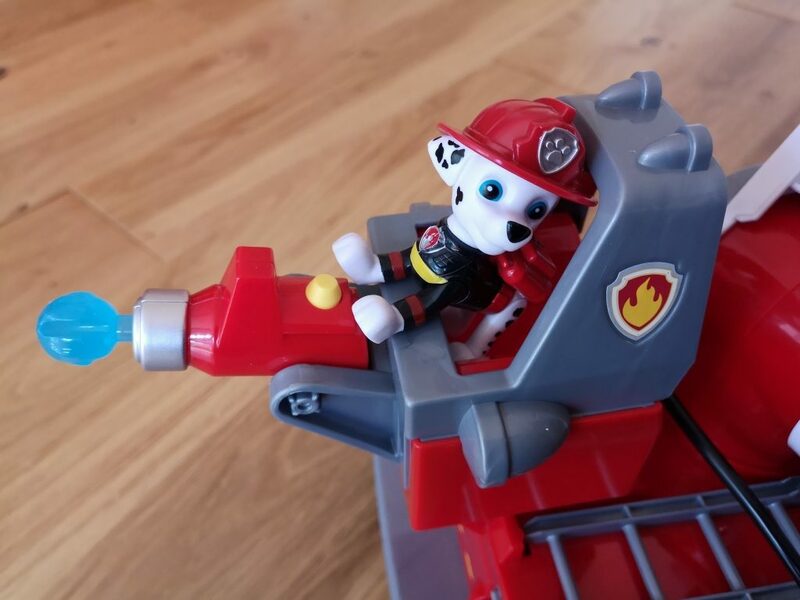 It comes with Marshall and space for all the Paw Patrol pups if you happen to have them (which we do, but they’re not included!). 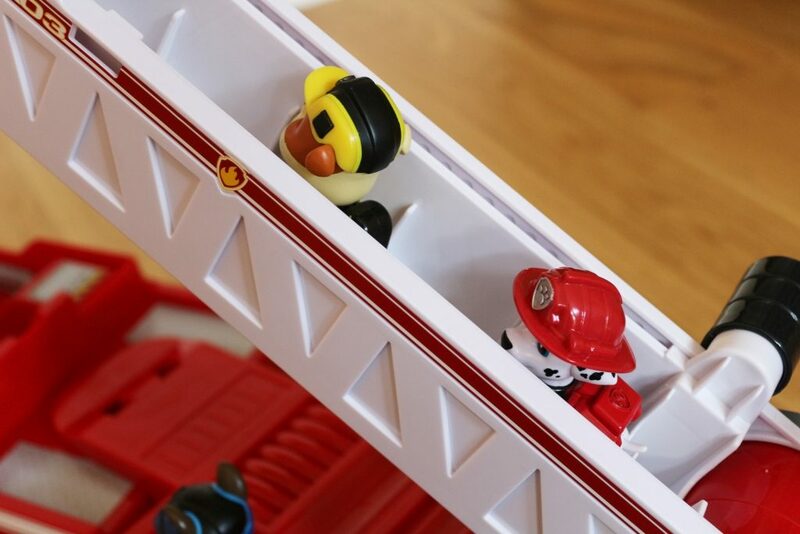 It comes with a removable ladder, four water ‘pellets’ and a mini fire cart big enough for one pup which fits inside a special compartment in the side of Marshall’s Fire Truck. The extending white ladder has slots in for the pups and Ryder to fit into. 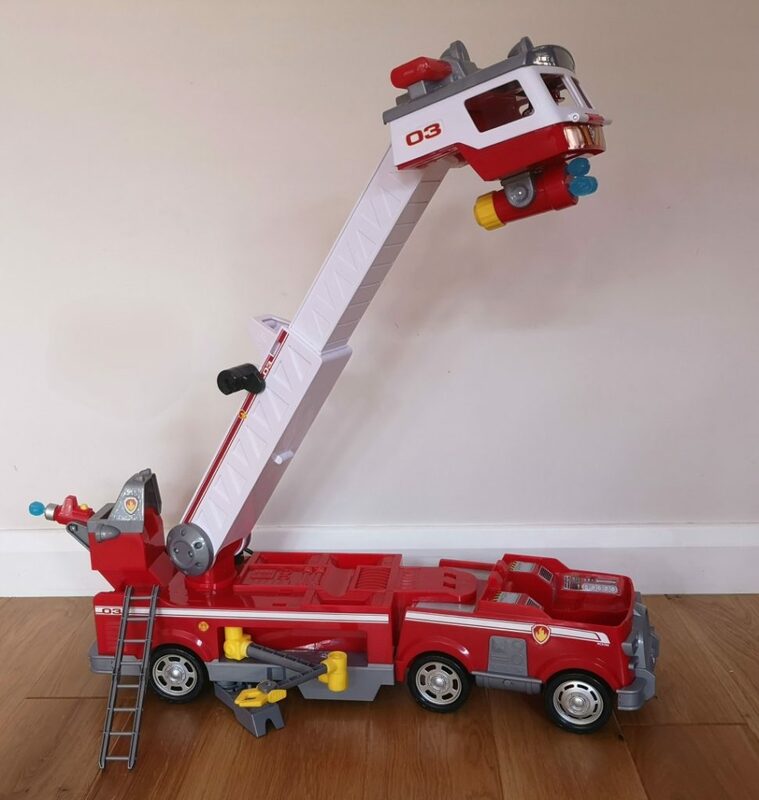 From a flat position on top of the fire engine it can be raised by pulling the ladder upwards using the white handle until the cab clicks out of position. The ladder can then be extended and raised up using the black handle and swivelled around. 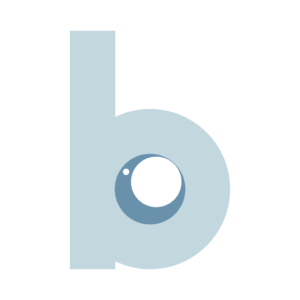 Before raising and extending the ladder, you need to make sure that the stabiliser bars on both sides are pulled out until they click so that the whole thing balances. 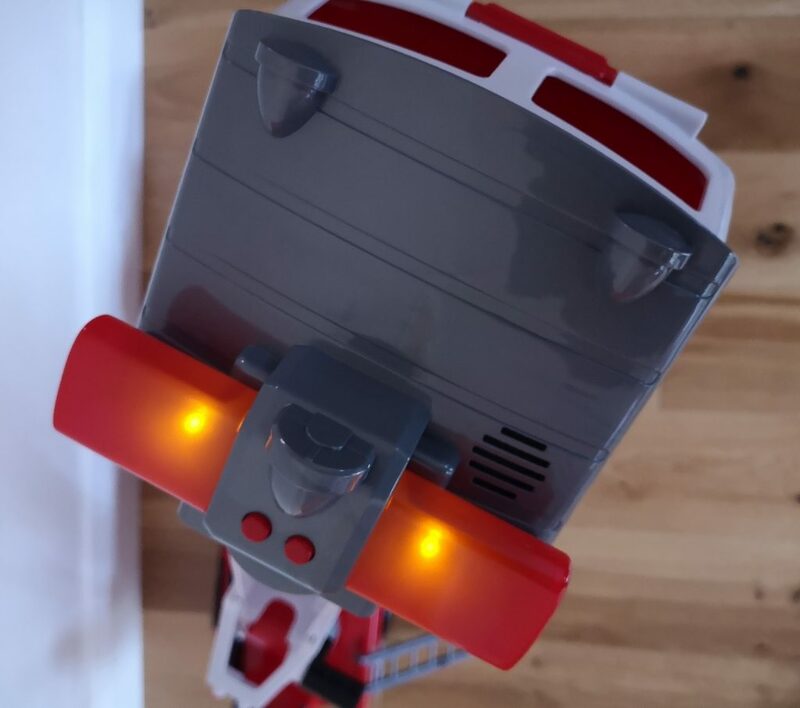 There are two little red buttons on the top of the cab, and when pressed they make sounds (including fire engine sirens and the Paw Patrol theme tune…) and light up. It’s short lived and fairly parent friendly I think! The cab opens up so you can place your pups inside. 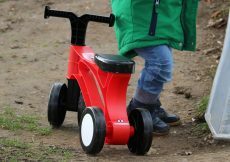 Of course the vehicle has moving wheels and so can be pushed along (if you have the space!) and it is articulated so it can be moved easily. The water cannons and the front (below the cab) and back shoot the ‘water’ pellets. Push them in until the click and then press the yellow button to shoot them and put the fire out! 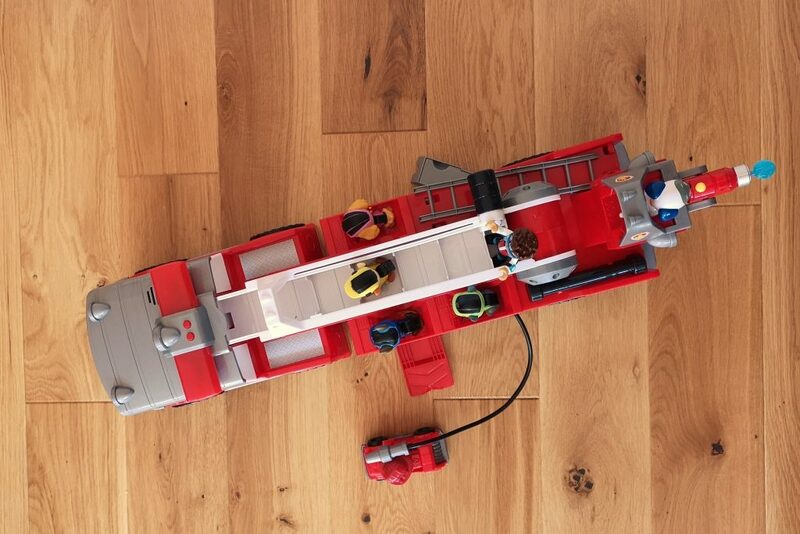 The Paw Patrol ‘Marshall’s Ultimate Rescue Fire Truck’ has an RRP of £69.99. 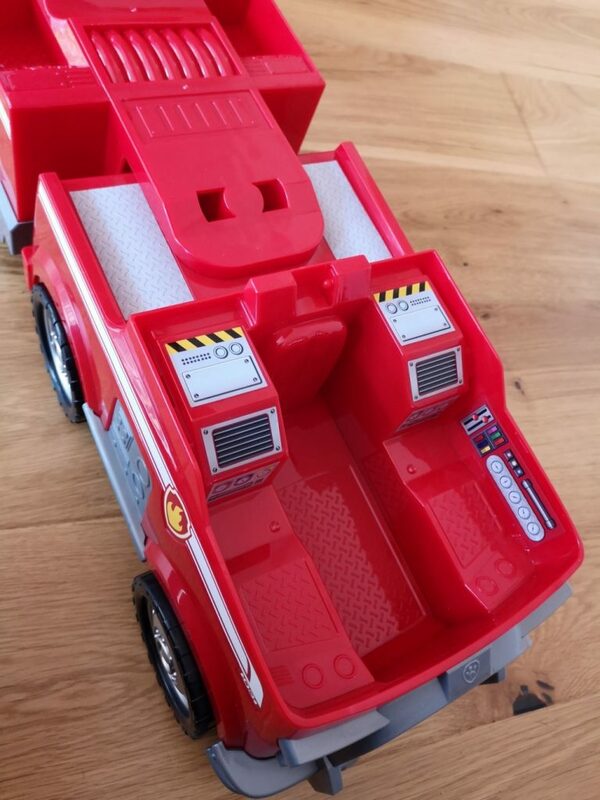 It is however a huge vehicle with a lot of play potential and definitely worthy of a main Christmas present for a HUGE Paw Patrol fanatic! 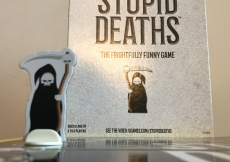 It is available from most national retailers and at Amazon via the links below. 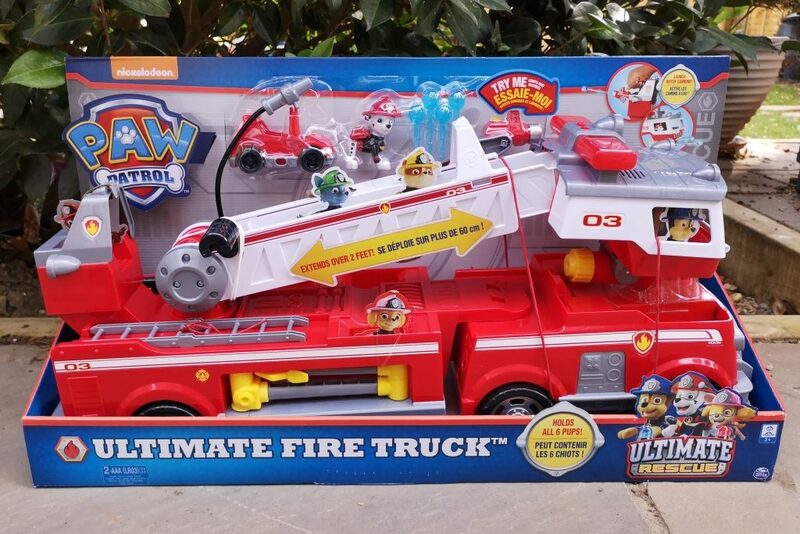 The Paw Patrol Ultimate Rescue: Marshall’s Deluxe Fire Truck was sent to us free of charge for the purposes of this review, but all opinions are mine. 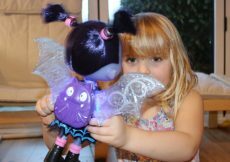 Vampirina: The newest Disney Junior show has a great new toy range!